Hip and knee are the two vital joints in our body. The constant and severe usage can sometimes cause its damage. 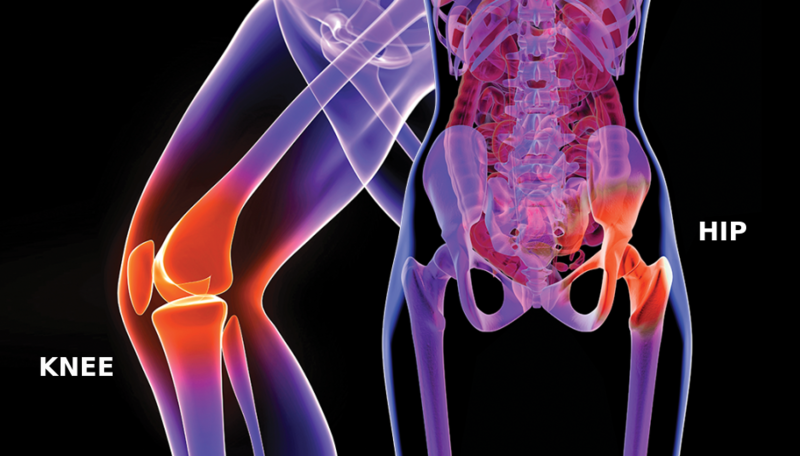 The main disorder affecting the knee and hip are arthritis. This is an increasing problem among the population nowadays. Arthritis of knee and arthritis of hip is one of the common condition that results in the disability of certain common and simple activities like standing, walking, running, etc. This is the resultant of progressive degeneration of cartilage from the end of the bone. Here the bare bones becomes exposed and generate a condition called bone on bone, where the bare bones get rubbed against each other. This generates severe pain, swelling and limited mobility of the body part. Knee joint replacement is a surgical procedure carried out to replace the damaged knee joint with an artificial prosthesis. This surgery is suggested by your doctor when you suffer from severe pain and difficulty to move due to the damage caused. While subjecting you to a knee replacement surgery, your doctor will consider certain factors like, your age, weight, activity level and overall health. If none of these factors are found to be troubling, the surgical procedure can be carried out easily. The surgical procedure takes only few hours for its completion, but the recovery from this can take you few months. Knee replacement surgery is only the last step adopted when other treatments like, medications, weight loss treatments, physical therapy and usage of assistive devices, are seem to be failed. In hip replacement, doctor surgically removes the damaged or painful joint with arthritis. This damages or arthritis affected joint is then replaced by artificial hip joint made up of metal and plastic. The hip joint is ball and socket structured, where the socket is a cup shaped component of on pelvis and ball is the head of thigh bone. In hip joint replacement, the ball is made of metal and socket of plastic or ceramic. This surgical process is carried out when all the other treatment options have failed producing any adequate improvement or pain relief. Dr. Thadi Mohan, the best orthopaedic surgeon in India, offers you the best Knee replacement in India and best Hip replacement in India. Being internationally practiced, he is well exposed to the orthopaedic surgeries, proving his efficiency and giving an increased rates of success.